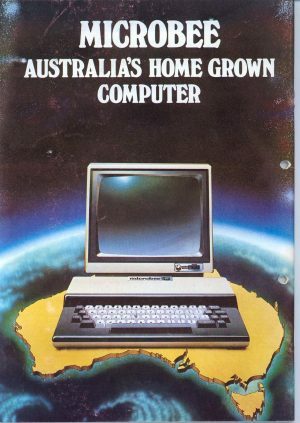 The Microbee was an Australian computer designed, built, and marketed by Applied Technology, in Gosford, N.S.W. Originally released in February 1982, it was intended for the schools market but also had a wide and deep following amongst home users. A considerable amount of software was published locally for the Microbee, through Honeysoft. Many titles were games (see our entries, for instance, on Chilly Willy, Hoards of the Deep Realm, Emu Joust, Bunyip Adventure, Raft-Away River, Halloween Harry, and Jewels of Sancara Island). Games were an important use of the Microbee, but the company explicitly encouraged users to adopt a similar playfulness and experimentation with regard to their computer itself. The Microbee was actively marketed in terms of its ability to be modified and ‘hacked’. In the 1980s, the term hacking was frequently used to describe the bringing together of various items of hardware, a sort of creative tinkering with computers, adding and extending their capabilities. 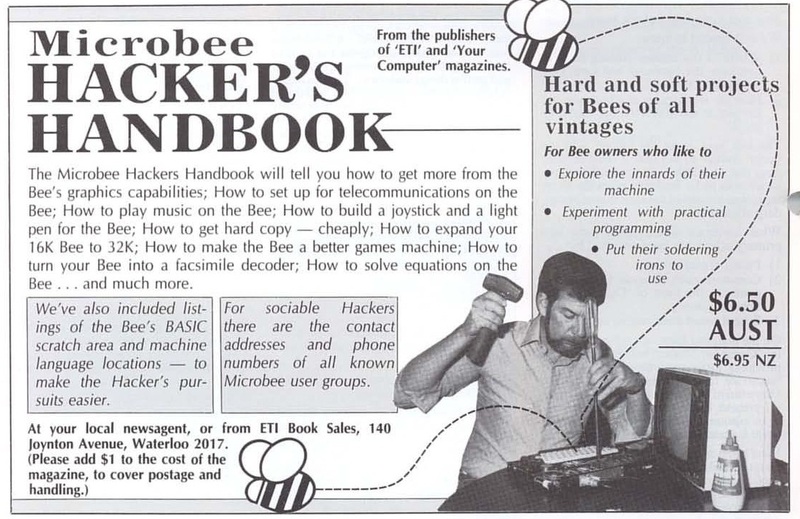 The ad for the Hacker’s Handbook (published by ETI and Your Computer) pretty much sums up the attitude. 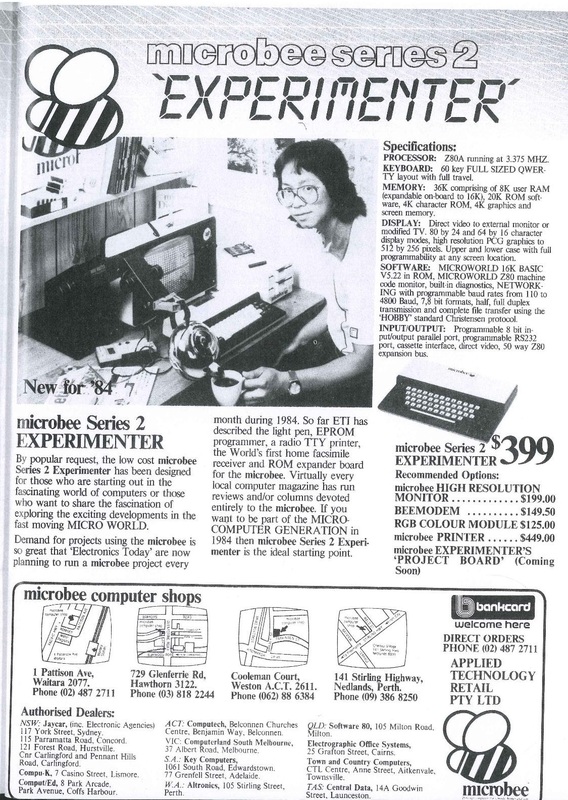 By the end of 1983, Applied Technology were extolling the benefits of the Series 2 – actually called the ‘Experimenter’ – with a remarkable advertisement featuring a robot arm (presumably interfaced with a Microbee) pouring a cup of tea for its operator. Did you have a Microbee? What did you use yours for? Was it solely for playing games on or for writing them too? Perhaps you were into electronics? Did you hack your computer (Microbee or otherwise)? What was the computer and what did you make? I have a few Microbee’s but my main one that I and the family used was a Premium 128k Microbee. The kids played lots of the games and used it for their homework using Wordbee or Wordstar and BeeArtistic for their graphics. I did a Turbo upgrade on the 128k Prem which basically doubled it speed. A few cut tracks, some extra wires and swaped the Z80A for a Z80B, thats all that was involved. Now runs at 6.75kHz instead of the normal 3.375kHz which made some of the games challenging. But it never missed a beat and still works today. I also added a clock kit onto the Coreboard but it never worked and reading the Technical manual, the early Premium coreboards had major problems getting the clock to work. So I never bothered with it. Its still all there, just doesnt work, but no real loss really. 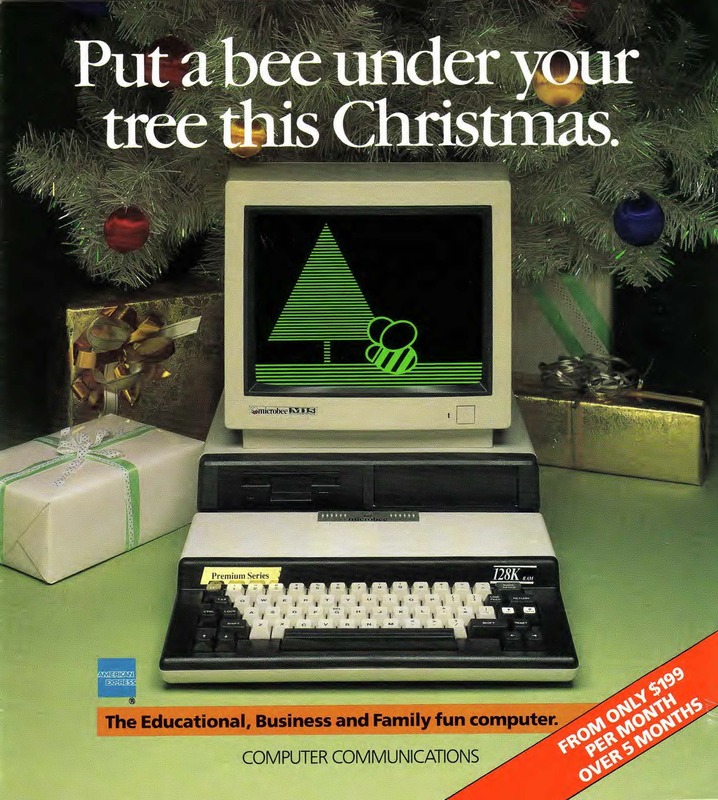 Here is a picture from a Christmas Microbee Brochure of the 128K Premium Microbee, the same as my unit except I actually had 3 floppy drives, 3 x 3.5″ and 1 x 5.25″. The 5.25″ was used to exchange data files (Multiplan files) with the MS-DOS PC at work at the time. I had a Microbee and I remember having a book that went with it that I used to copy out programs to make simple games, like the one in the box with the caterpillar that got longer and longer as it went round. I played emu joust too, that game was great. I was in primary school when we had the Microbee and I have really fond memories of it.